Bonathaba, South African pomegranate grower-exporter, last week started with their Wonderful harvest, somewhat earlier than usual, but it’s a nice harvest and after the drought of the previous three years, things have returned to normal, says Allan Puterman, operational director. The Bonathaba pomegranate farm, outside Wellington, is one of the oldest pomegranate farms in the country with 40ha of pomegranates. The Hershkovitz and Acco harvests are done and for the next week Wonderful will be harvested. He notes that technical experts from Israel have pointed out that their fruit is sweeter than the same varieties grown in Israel, even on varieties notorious for their tartness. Bonathaba has an interest in a pomegranate nursery, TOP (The Original Pomegranate) Nursery, also in Wellington, and has mother blocks of a number of new pomegranate varieties, among them the Israeli Emek variety, under license from Citrogold. They’re very excited about the possibilities of this variety. A very early variety has positive water implications in a dry area like Wellington because it needs water for a shorter period than a variety picked a month later, providing a safety cushion to the grower (as was seen during last season). Bonathaba exports 95% of its fruit. 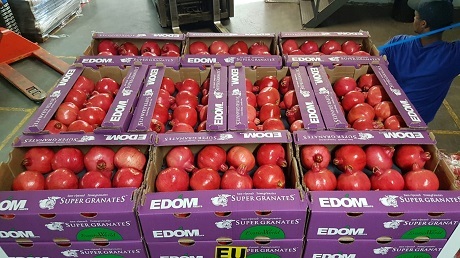 They’re a counterseasonal pomegranate supplier to EDOM Fruit for the UK and European markets, where the fruit is jointly branded and there is currently good demand for fruit. They also supply Russia. They would like to extend their market portfolio to Canada (where they’ve sent small volumes before), the USA, the Far East and the Middle East. On the domestic market, they’re seeing a trend towards smaller calibres fruit which have two advantages: it’s less expensive and consumers can utilise a single fruit in one sitting.